Walk on the wild side with the future King of Pride Rock, press his paw and watch him come to life, talking and moving his head to music. Sing along together to movie hits Hakuna Matata and I Just Can’t Wait To Be King! 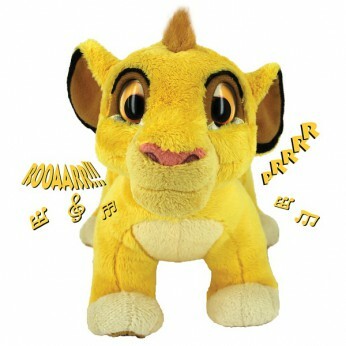 With over 15 fun phrases, life like eyes and fluffy mane and tail, sing and play with your very own Simba. Requires 3 x AAA batteries. Try me batteries included…. Walk on the wild side with the future King of Pride Rock. Press his paw and watch him come to life, talking and moving his head to music. Press his paw to hear him talk or move his head to music. Hear him talk and sing, purr and roar; Let’s sing together…. I just can’t wait to be King. One supplied; Size H21.5, W21.5, D13.5cm; Batteries required: 3 x AAA (included); For ages 3 years and over; EAN: 5029736043407. WARNING(S): * . This toy costs approximately £14.99 (for the latest and best prices make sure you check our retailer list for the Sing and Roar Simba above). In our review of Sing and Roar Simba we classed it as being suitable for ages 3 years, 4 years, 5 years but recommend you check the manufacturer specific advice before purchasing.